We help you establish where you are on The Growth Curve. Knowing where you are on this curve gives you a strong competitive advantage if you choose to use it. This knowledge facilitates establishing what your next level of ‘predictable’ maturity or growth will be. And, because you can ‘predict’ what the next level of growth will be, you can use the right amount of overall resources to get to the next level faster. This results from more clearly understanding where you actually are in the evolution of the company. There’s another big benefit, too. 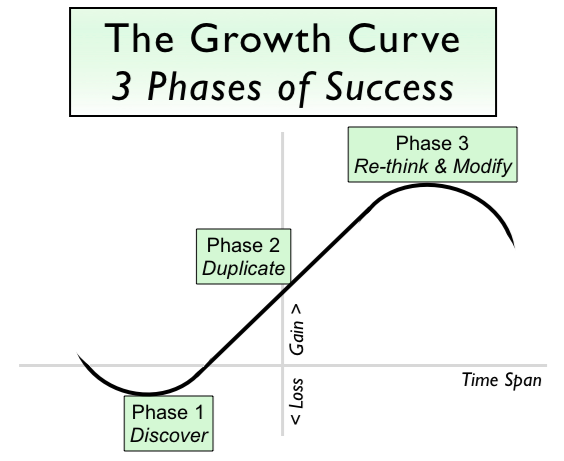 Knowing where you are on the Growth Curve also allows you to get through the ‘pain’ of growth significantly faster. Although this pain can never be totally avoided (because it is an inevitable part of business growth), we can help make it easier.